"We are of the view that no form of order shall be made at this stage pending hearing of motion on notice", the court said as it consequently adjourned the matter till January 24. Still on the matter, Justice Evelyn Maha of the Federal High Court, Abuja, had issued two separate orders asking parties to maintain status quo in the CJN's trial pending the determination of the motions filed by the Incorporated ‎Trustees of the Centre for Justice and Peace Initiative, and the Incorporated Trustees of International Association of Students. "This means that parties must observe the rule of law by not doing anything that would tamper with the subject matter pending the determination of the Motion on Notice." 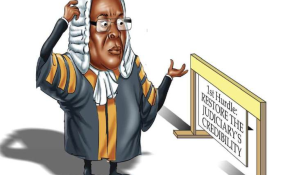 It was, however, silent on relief five which had sought "an order of interim injunction restraining the defendants, whether by themselves, officers, agents, servants privies or otherwise howsoever described, from appointing or directing the fourth defendant (Honourable Justice Ibrahim Tanko Muhammad) to take over as the Acting Chairman of the National Judicial Council and as the Acting Chief Justice of the Federal Republic of Nigeria, pending the hearing and determination of the Motion on Notice." In a statement signed by the body's president, Mr. Paul Usoro (SAN), it maintained that due process is not followed when the executive branch of the government files an interlocutory motion before the CCT for the removal of the CJN. "Such an application disparages, and assaults due process as enshrined in Section 292(1) (a)(i) of the constitution of the Federal Republic of Nigeria, 1999 (as amended). The said section is very explicit on the due process for the CJN's removal when it stipulates that a judicial officer shall not be removed from his office or appointment before his age of retirement except in the following circumstances. In the case of the CJN, by the president acting on an address supported by two-thirds majority of the Senate." "Being a country governed by laws, the Federal Government owes us a duty to comply strictly with these provisions of the constitution for the removal of the CJN. "We therefore urge the executive to please retrace its steps and discontinue the entire proceedings before the CCT forthwith and follow the constitutional procedure afore-stipulated," it stated.